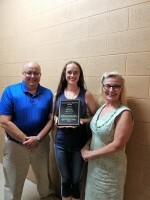 Because volunteers define Great River Players success and achievement, the Board of Directors created the Outstanding Service Award to recognize persons who have performed extraordinarily for GRP. The award is to honor those who have helped GRP work toward it's mission of providing quality live entertainment to the community. It is awarded at GRP's annual Curtain Call. * At least 5 years of active involvement in any capacity in GRP productions and activities. * Demonstrated dedication to the ongoing success of GRP and community theatre. Nominees need not be currently active and nominations and awards may be made posthumously.